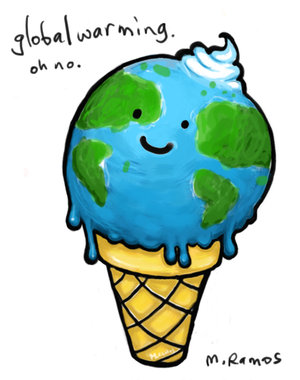 Discourses associated with climate change caused a moral panic around the world. These discourses has developed into the center of attention of almost all experts from various fields of philosophy and science. Public discussion on climate change held in various parts of the world. World leaders gathered in Copenhagen, Danish to seriously discuss the various efforts to prevent further damage caused by global warming. But the moral panic seems less felt in Indonesia. Instead of being a part of dominant public discourse, the debate over climate change and global warming are only only in theoretical level. The social lifestyles and government policy at the national level do not reflect moral panic or real concern about the problems. Climate change and global warming are facts that must be faced with the clarity of thought and precision of action. So it is appropriate, if the problem is worthy of being part of a moral panic. It will be part of the overall concern of humankind. At least there are four characteristics of a healthy moral panic, as has been formulated by Thompson. The first is the existence of a phenomenon that threatens the values of community life. Climate change and global warming threatens human life directly. The potential for disaster in the form of famine, drought, and other natural anomalies, such as hurricanes and tsunamis, immediately hit the whole of human existence. Climate change and global warming must be part of the moral panic and public concern around the world, especially in Indonesia. The second, the threat can be precisely defined by the community, especially the media. Climate change and global warming can be directly recognized by the community by its symptoms. The temperature of the earth is heating up, plus the ever-expanding desert in some parts of the world, is a direct result of the problem. Mass media and NGOs, both national and international, have repeatedly voiced their concerns about this. Various scientific studies in various fields of science has been done to reinforce the importance of the various countries around the world to face this problems. The third, the phenomenon must be so urgent, that the community have to take action, no matter what. In Indonesia, the discourse on corruption and public justice was a moral panic, but not the discourse on climate change and global warming. All three are very important discourse. Therefore, all three should be part of public moral concern. The fourth, the moral panic will lead to social change. Policy makers and public figures will move public opinion toward a completely new point of view. In this case, climate change and global warming must change the lifestyle of Indonesian society, and not limited to discussions only. Fossil-based energy savings in industry and transportation, reforestation, and preservation of green areas in big cities is the concrete manifestation of these lifestyle changes. This problem has already become moral panic of many developed countries, except the United States and China. In Western Europe and Scandinavian countries, the public has made climate change and global warming as moral panic of their community. However, in this matter, Indonesian society is still left far behind. Indeed, many public discussions have been conducted. However, lifestyle changes still not visible. hehehe… iya saya setuju. Penyakit kita adalah kita tidak melakukan apa yang kita ketahui, dan jutru melanggar apa yang kita tahu tidak boleh dilanggar. Ini sebenarnya bentuk keterpecahan diri. Saya sendiri terus berusaha untuk tidak jatuh dalam keterpecahan diri semacam ini. site gives helpful facts to us, keep it up.